OpenID is really taking off. We’re seeing more and more sites which offer OpenID login in addition to the standard create/sign-in login system. Still more sites are offering to be an OpenID provider (such as AOL and LiveJournal). Distributed single sign-on for the web is really a compelling concept, and I can see why it’s becoming so popular. However, OpenID does have it’s issues. Obviously, there are questions about login security, since OpenID just authenticates you, it doesn’t ensure you aren’t a spam-bot or similar. But the big issue for me is (ironically) how much more typing it costs. Think about which is easier: to type a username and a password (a pair which you probably type several times a day), or a long, unwieldy URL? Personally, I find it takes much longer to type the URL than the username/password, and this of course cuts into my workflow and interrupts my train of thought. The ultimate solution would be if my browser could prefill my OpenID into any OpenID login form elements on the page. This doesn’t have the issues that the Password Manager in Firefox has, because I don’t really care if everyone knows what my OpenID is; they can’t use it anyway. (one of the many wonderful things about OpenID) Now as I understand it, this feature is coming in Firefox 3.0, but I want something that will solve my problems now. Enter Greasemonkey. If you haven’t already installed this extension, you really should do so. You can do tons of stuff with the right script, like moving or removing elements around the page, or adding functionality to Gmail, or even reverting recent interface changes made at DZone. This extension really is a must-have for any web power user. In fact, this extension is exactly what we need to solve our little OpenID prefilling problem. As you can see, all this does is search for input type=”text” elements with “openid” or “openId” in the id or the name attributes. If it finds such a field, it sets its value to the OpenID we’ve hard-coded into the script and moves on. Simple, yet effective. To use this script yourself, simply install it into Greasemonkey and set it to run on all sites. 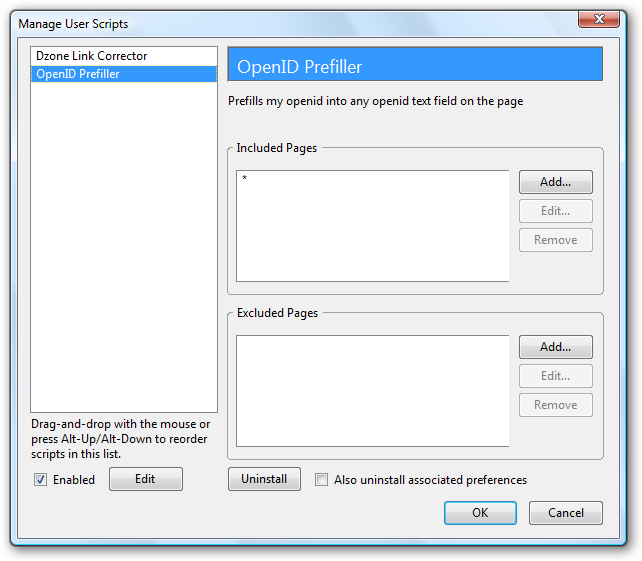 Open up the script, and change the OPENID String value to your own OpenID. Save the script, and you’re on your way! Exactly what I was looking for – thanks!